NEW YORK (Reuters) - A former Hong Kong government official was sentenced to three years in prison on Monday by a U.S. judge following his conviction for bribing officials in Chad and Uganda in exchange for contracts for a Chinese energy company. 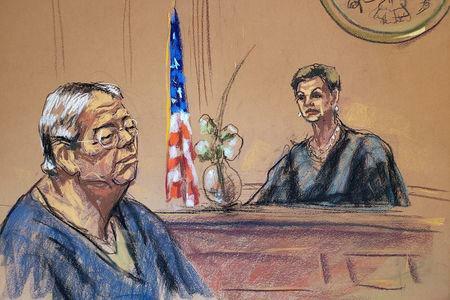 Chi Ping Patrick Ho, 69, was sentenced by U.S. District Judge Loretta Preska in Manhattan federal court, where he had been found guilty of seven criminal charges last December. Ho, who has been in jail since his arrest 16 months ago, had sought a sentence of time served, while prosecutors had sought five years. Preska said her sentence took into account Ho's "extraordinary" history of charity, which included becoming a mentor to another prison inmate whom she had sentenced. "I feel great remorse that my actions and my situation have caused too heavy a burden on my family," Ho said in court before being sentenced. "I am deeply sorry." Edward Kim, Ho's lawyer, said he and his client were considering options for appeal. Ho was arrested in November 2017 on charges of violating U.S. foreign corruption law, money laundering and conspiracy. Prosecutors said he arranged bribes on behalf of Shanghai-based energy conglomerate CEFC China Energy. Prosecutors also said that Ho caused $500,000 to be wired to Uganda's foreign minister in 2016, with the promise of further payments in the future, to secure favors for the Chinese company, including the potential acquisition of a Ugandan bank. Sam Kutesa, who previously served as president of the U.N. General Assembly, has been Uganda's foreign minister since 2015. Uganda has denied the allegations. In one email, Ho described himself as "the first of the sacrificial lambs" of hostility between the United States and China. Ho sent that email following an exchange about the arrest of Huawei Technologies Co Ltd Chief Financial Officer Meng Wanzhou on U.S. charges in Canada, which has fueled tensions between the two countries.